Put your checking account in your pocket with anytime access to your balance. With our debit card in your wallet, you always have convenient access to funds without having to write a check or run to the bank. Make purchases in stores or online, or get cash from any ATM. 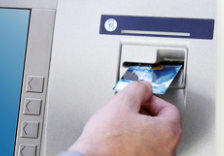 We offer over 43,000 ATMs nationwide at no cost to you! Find an ATM near you here.